Made in Space created the 3D printer installed on the International Space Station that works in a microgravity environment. NASA has decided to open the design process for some parts for the Station to the public. For example, people are encouraged to submit designs for a handrail clamp to hold various objects (https://grabcad.com/challenges/nasa-handrail-clamp-assembly-challenge). This competition (which ends in February) has cash awards, but I think no award could be greater than having something you designed installed on the ISS! The game board is a square shape with eight rods on which pieces can be placed. 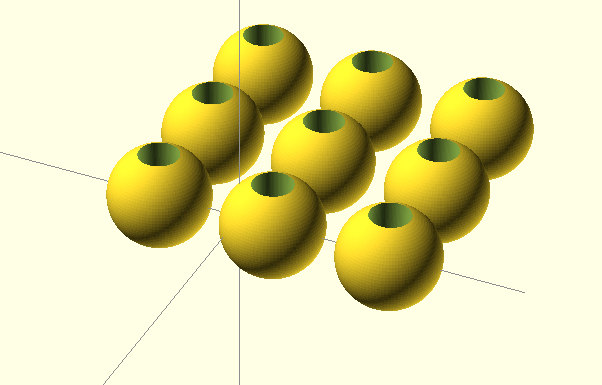 The goal is to get three of the same shape in a row, either horizontally, vertically, or diagonally on any of the four faces. The game pieces are round balls and crosses with holes in them to let them stack on the rods. All the pieces are exported as STL files for the printer to use, and I chose different colors for the board, the noughts and the crosses. While the rules are the same as for ordinary tic tac toe, the game is made more challenging by addition of the four faces, and that any vertically stacked shape has to be on top of the platform or another shape. I made 12 of each shape – enough to fill the entire board. On September 19-20 Norma and I attended the World Maker Faire at the New York Hall of Science. This extravaganza had so much to offer that two days were barely enough to scratch the surface. The Faire itself had everything from exhibits of new tools for makers to hands’-on areas where you could learn to solder, or build thngs of your own. programs with wooden blocks whose bar codes were then scanned by a robotic platform that would then follow the instructions in the program. This project was one of several Kickstarter projects on display. receiving a lot of attention. This under-$400 printer doesn’t have a very large print volume, but has some super features, including a special circuit that maintains alignment of the print head automatically. Many other 3D printers were on display but one of the ones getting a lot of attention was the new system being sold by Dremel. This is one of the first 3D printers with a well-known name behind it, and this device will be sold in places like Home Depot. When 3D rinters first started showing up for the hobby market, they required a lot of adjustment to keep them working well. In the following years, features (like self-leveling build plates) started to become more common. The fact that well-known brands are entering the market shows that this technolog is becoming mainstream. This doesn’t mean that smaller companies will go away, just that they will be held to high standards. 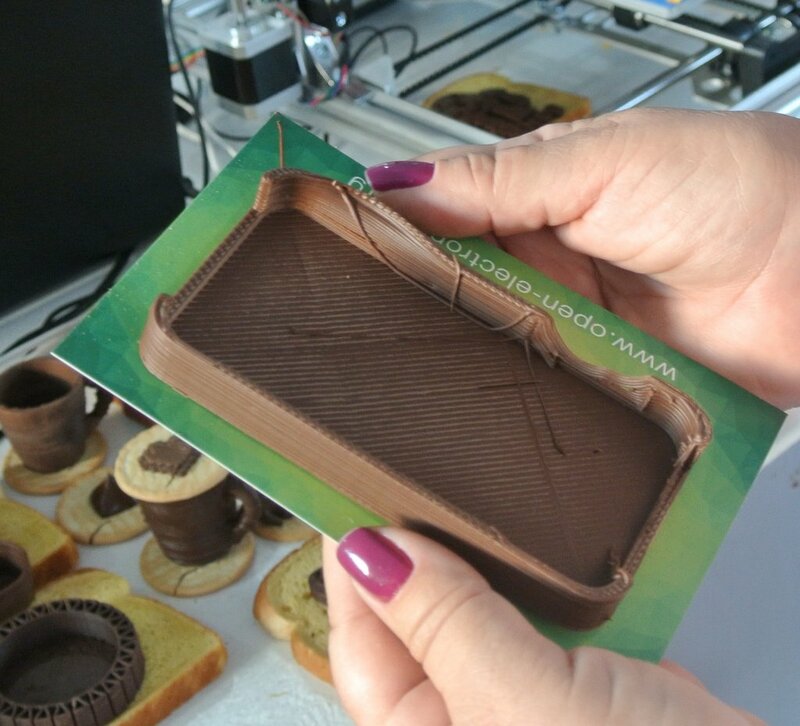 interesting devices, including a 3D printer using chocolate (in case you get hungry and want to eat your iPhone case). Another system from FABtotum in Milan combines a 3D printer, computer controlled milling machine, and high resolution scanner into one elegant box. Products like these help set the stage for the next Maker Faire! MIT’s Mitch Resnick has said that Maker Faires are great staff development for educators. Our experience shows he is right. Today was the first day of the World Maker Faire held at the New York Hall of Science, and Norma and I were there the whole day and still didn’t see everything. But we will go tomorrow as well. Once we get back to Chicago I’ll post a more detailed report with photos of some of the more amazing things we saw. The 3D printer world continues to grow. 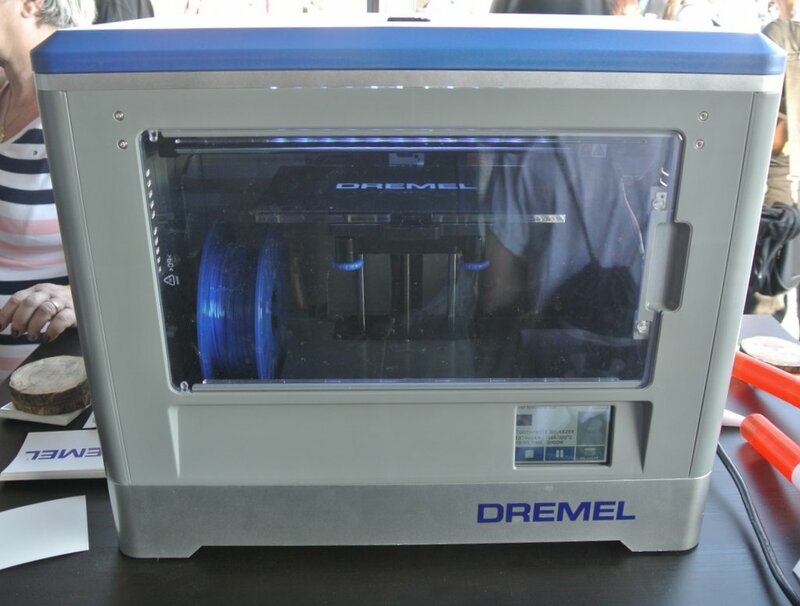 Dremel (the popular maker of hand tools) showed their $1000 printer. While it is not as feature rich as other printers on the market, they have arranged to sell the device through Home Depot stores – starting with 100 stores and expanding from there. Needless to say, other vendors of 3D printers are paying close attention to Dremel. 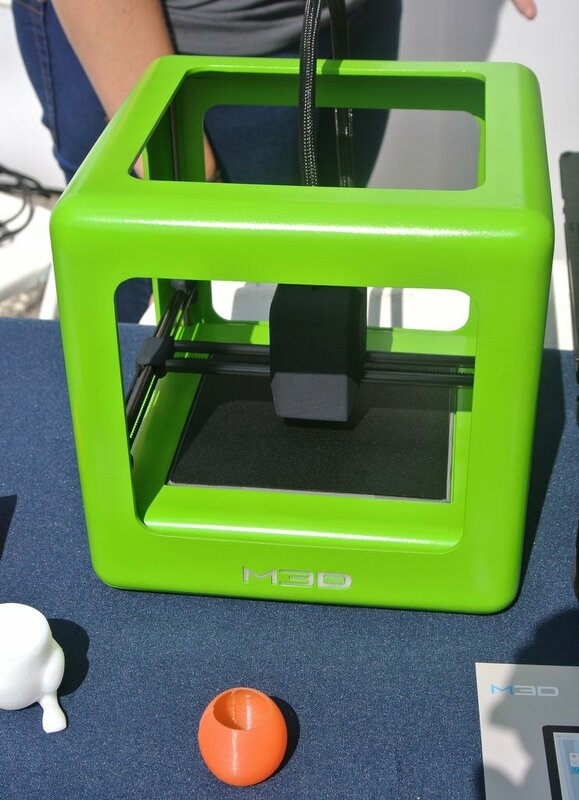 Kickstarter had a region of the massive exhibit where (among many other things) M3D showed their $350 3D printer that self adjusts as it is making parts. The print space is not very big, but my guess is this will become a starter printer for many folks. Right now they are filling their first 11,000 orders. NASA has an interesting exhibit, but was unable to get one of the special 3D printers planned to be launched to the ISS Sunday morning. As regular readers of this blog know, Norma and I are focused on additive fabrication in which parts are built layer by layer in a 3D printer. Another fabrication process known for many more years is subtractive. You start with a block of material from which material is milled away to leave the final shape. Several vendors of these computer numerically controlled (CNC) machines were showing their products, but the one that really caught our attention was the Fabtotum from Italy. 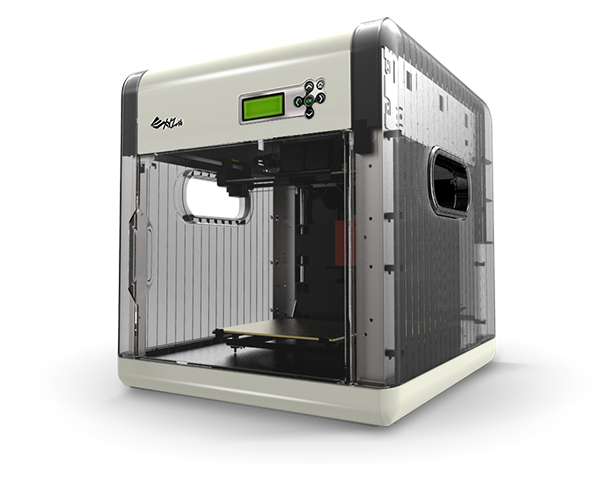 This machine functions as a traditional 3D printer, a CNC milling machine, and a 3D scanner. The system sells for about $1500. Needless to say we will be looking at this in more depth as we help schools think through the design of Maker Spaces where numerous kinds of tools are needed. Later we’ll give our wrap-up of the entire event with pictures of some of the cooler things we saw. 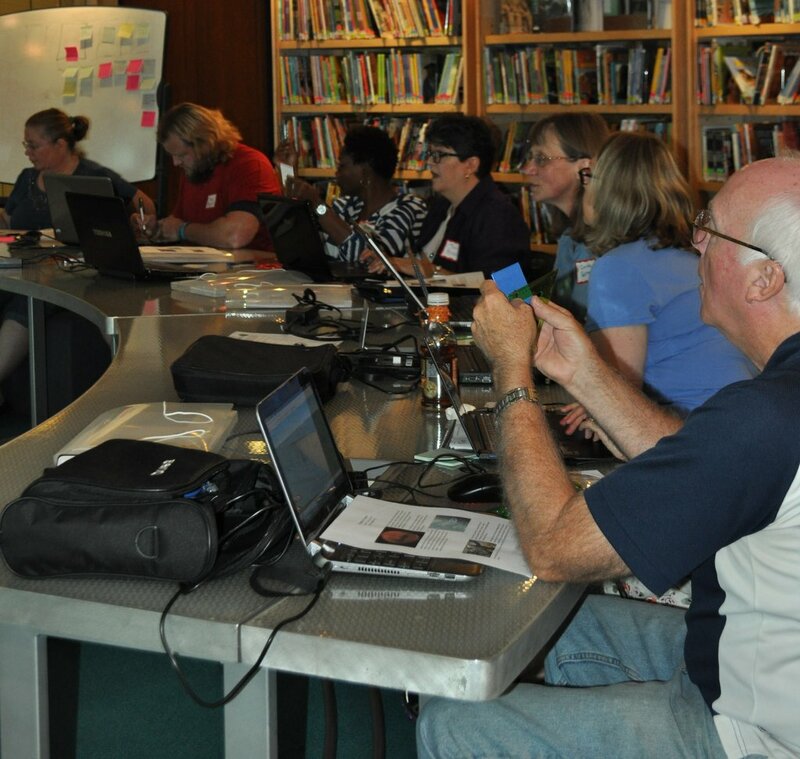 Last week we conducted a workshop for educators on 3D printing in the Indianapolis public library. They have a space that was perfect for working with twenty educators. 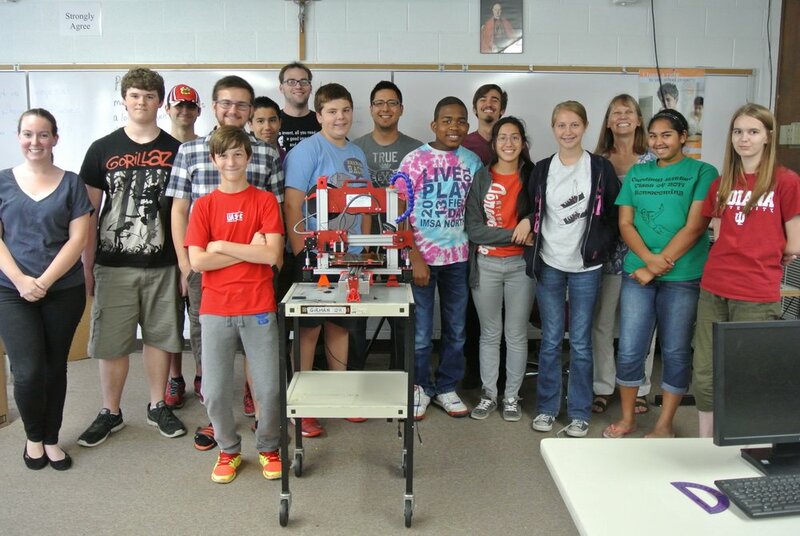 Several 3D printers were provided by 3D Parts Mfg., and Norma and I were the workshop leaders. We started with a big challenge that put the participants in the deep end of the pool. (I’m not sharing the task since some of you may be in one of our upcoming workshops and I don’t want you to get a head-start!) The point is that the participants saw cross-curricular connections to this activity. This is important because teachers, in general, want to see how any new thing connects to the curriculum they are responible for. One of the nice characteristics of 3D printing is that virtually any activity cuts across all the STEM subjects, and many can even be connected to other subject areas – including fine arts, history, and others. From our perspective, the critical element was having the participants see themselves as designers. Toward that end, we made sure they had access to several 3D design tools rather than just focusing on a single tool like Tinkercad, for example. The fact is that some kinds of designs are easier in some tools than in others, and the more choices teachers and students have, the more likely they will be to create incredible designs. Some teachers felt that recipes for projects were appropriate, and they did projects from our book The Invent to Learn Guide to 3D Printing in the Classroom, since these projects are already in recipe form. We had plenty of assistance from Kim Brand and his colleagues at 3D Parts Mfg. They provided the printers we used, and handled all the logistics so all Norma and I had to do was show up with our handput packages for everyone. Since that workshop we have been contacted to conduct more workshops around the country. The 3D printing revolution is ready for prime time! 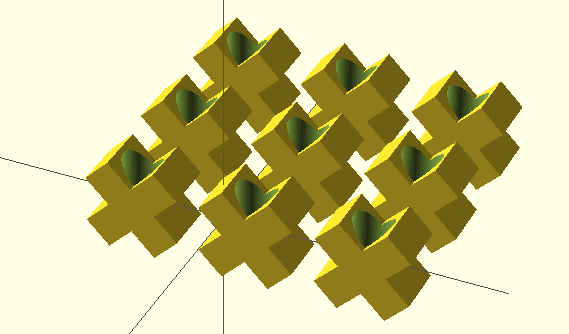 Our upcoming workshop explores many things, including how to extrude two-dimensional graphics created with TurtleArt into three-dimensional shapes that can bed for many things – including pressing patterns into clay for decorative tiles. The original idea for this project came from a great blog by Josh Burker (http://goo.gl/cjuBrH). The following Animoto video shows a project done (with some help from us) by our 7-year-old Granddaughter, Bianca. 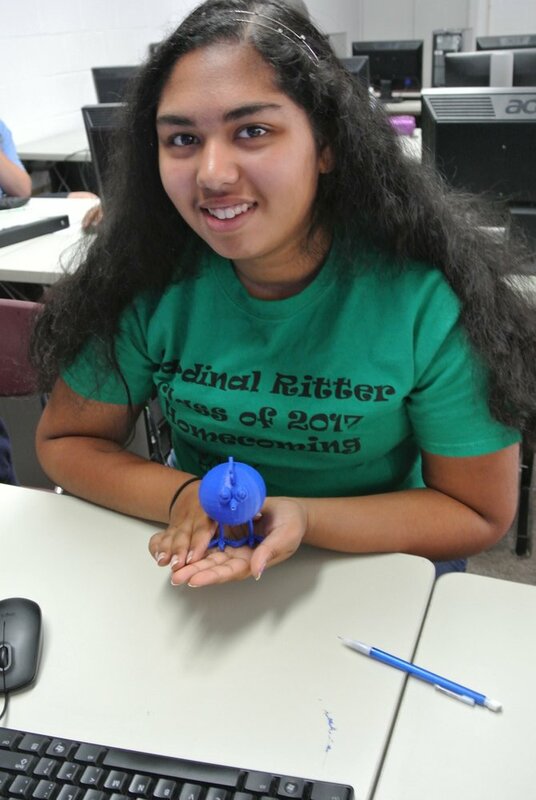 She will be coming to our 3D Printing in Education workshop in Indianapolis later this week. 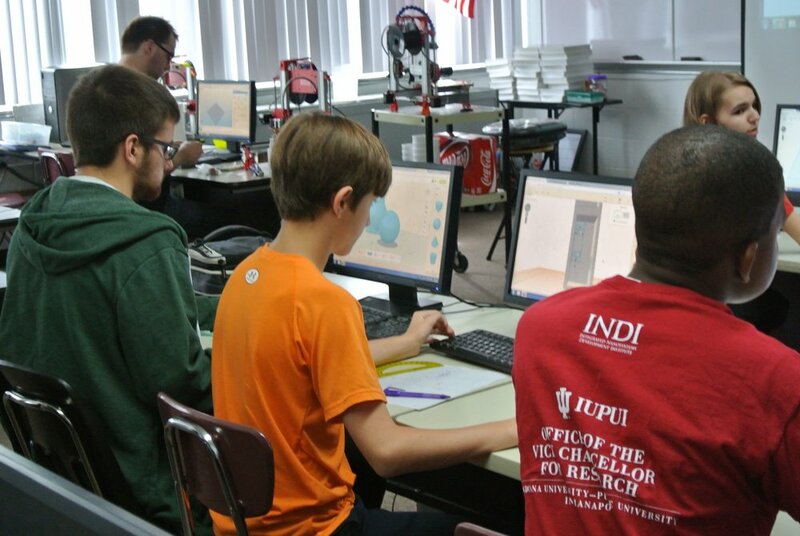 From fine arts to STEM education, 3D printing is a powerful tool! Regular readers know that I usually post longer blogs on particular topics, but we have an event coming up that should be of interest to many of you. 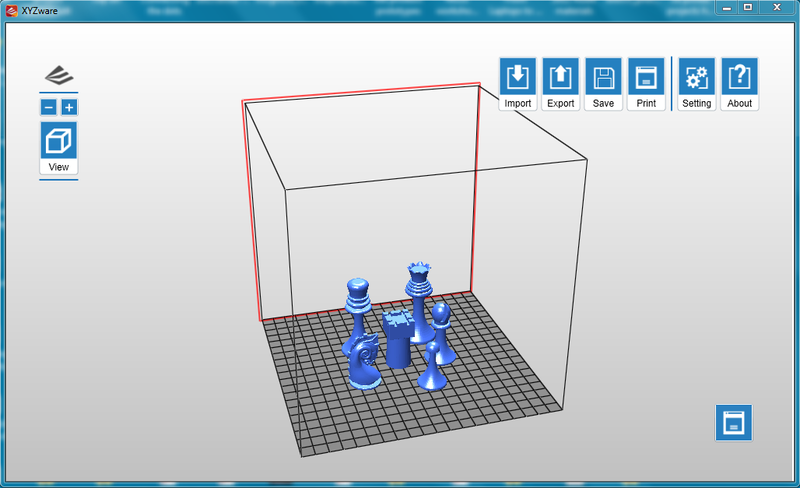 I have two 3D printers already, and am familar with several others that look interesting. In my quest to stay on top of this dynamic field, a few weeks ago I got a da Vinci 1.0 3D printer from Studica (www.studica.com/XYZprinting), a company whose focus is on hardware and software products for education. Studica sells a complete line of 3D printers, but the one that caught my attention was the da Vinci. This machine retails for $499, which is staggeringly low when you look at the system. First, it has a very large print volume – 20cm by 20cm by 20cm. This makes it one of the largest print beds in the under $2,000 printer category. 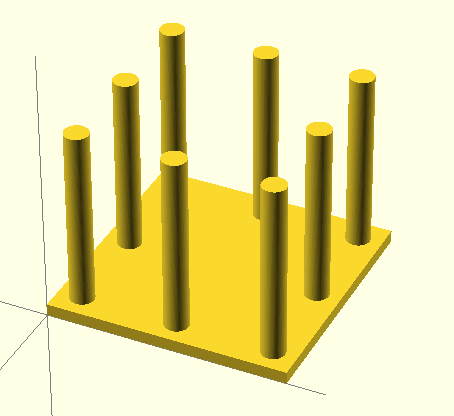 The ABS filament is provided in nicely designed cartridges that don’t cost an arm and a leg. The overall look of the printer is quite elegant. The transparent case lets you see everything as it is printing (especially if you turn on the interior light.) A built-in display lets you do a lot of tasks (such as loading or changing filament) without having a computer attached. This printer uses a glass print bed that you coat with a thin layer of glue from a regular glue stick. The advantage of this adhesive method is that you don’t generally need to print using a “raft” – a layer of plastic put down by the nozzle before the parts are printed. Another nice touch is that the print nozzle is automatically cleaned after printing and any extra filament strands are placed in a box that can be removed later to get rid of scraps. The internal hardware looks very well designed. In fact, just looking inside this machine made me think I was looking at a very high end printer! As with any 3D printer, it is essential to be sure the print bed is calibrated properly, otherwise the parts will look awful. The da Vinci printer is calibrated at the factory, but, in shipping, the calibration screws may get jarred from their optimal positions. Fortunately, this is easy to fix, and the technical support team sent me a link to a short video to show, step by step, how to align the print bed. The print head has a special electrode on it that is brought into contact with the build plate hardware at three locations. The built-in display then lets you know what adjustments are needed, or, if it is in the range of automatic alignment, to accept the new settings. In my experience, this task only needs to be done once. Once the printer is finished with a job, the bed is cooled down and moved to the bottom to make it easy to remove your design. The manufacturer provides a plastic scraper to separate the part from the bottom of the build plate. My experience is that, once the part has cooled down, the plastic contracts just a bit, and it is easy to snap the part from the plate, leaving a very smooth finish on the bottom, and the build plate ready to be cleaned and coated with a new thin glue layer. As for print quality, the parts are not quite as nicely finished as those I make on my Afinia printer, but for most school projects it is pretty good. The downside is that this printer takes a lot of time to print projects. In a school setting, time is important; but the large build plate might let you print several student projects at a time, making this less of an issue. Overall, I rate the industrial design very high. The price is unbelievably low. Technical support is wonderful. The only downsides when compared with more expensive printers is the print time and slightly reduced print quality. Taking everything into consideration, the da Vinci 1.0 is a good buy for those wanting to get involved in 3D printing. Later, some may choose to scale up to more expensive printers with higher print quality and faster speed, but, even then, this printer will get a lot of use! My friend, Peter Skillen (http://theconstructionzone.wordpress.com/blog), coined a term I really like – “Tinkering-Based Learning” (TBL.) While this kind of learning can take place within the broader context of Project-Based Learning, it differs in that the student learns by tinkering with ideas in the quest to build something. In terms of Seymour Papert’s ideas, this would be called Constructionist (as opposed to Constructivist) learning. It also accurately represents what a lot of engineering design is about – tinkering with ideas, trying things out, and repeating the process until you get the resulting design you are looking for. I once heard an engineer from Rolls Royce jet engine division say that it takes about 20 tries to get a design right. Very clearly this is not what most classroom practice looks like. My interest in this topic was rewarded last week when we attended part of a week-long summer camp on 3D printing designed by Kim Brand and his colleagues at 3D Parts Manufacturing (http://www.3dpartsmfg.com/). This camp, in Indianapolis, Indiana, had about a dozen boys and girls ranging from grade 6 to 11 who were enticed by the idea that they could build objects of their own design. On the software side of things, most students used cloud-based tools like Tinkercad and 123D Design, although there are many rich software titles from which to choose. In fact, our list of favorite titles is shown in an earlier blog. Students were encouraged to design and build something that was practical, and to also design something that was playful. It was great to see the intensity with which the kids worked, and how willing they were to help each other out if someone got stuck. There was no formal instruction on the use of the software beyond letting them know that when their project was finished it needed to be exported as an STL file so it could be printed. Two printers were provided by Kim Brand – his “STEAM engines” (Science, Technology, Engineering, Art, Mathematics.) These printers operate at a sufficiently rapid speed that many students were able to get their projects printed right away. Projects submitted on the last day were printed and sent to the students later. From our standpoint, the enthusiasm of the kids was amazing to see. They were working on their projects non-stop, driven by nothing more than the desire to design and build their own creations. The summer camp model makes a lot of sense because you can have kids work together all day long for five days – plenty of time to do some amazing work. But this doesn’t mean that TBL doesn’t have a home in ordinary classrooms. The challenge is for teachers to create opportunities for kids to solve real problems. A single problem may take several class periods to finish (although a few of the students worked on their designs from home in the evening.) The point is that TBL does not have to be devoid of structure. In fact, the more meaningful the problem, the more powerful the activity. An example we have used with students is potentially quite important in the future. Imagine a trip to Mars – the likelihood is that the ship will not have every conceivable spare part, but will have a 3D printer of the kind made by Made in Space scheduled to go to the ISS this year (http://www.madeinspace.us). Imagine that the outer wall of the craft is hit by space debris, creating an ugly hole through which air is leaking out of the ship. The challenge is to design and build a plug that stops the leak. This design can be done with free software (like Sketchup Make) and, once each team compares designs with others, a final design can be made, printed, and installed, this saving the mission. Of course, this is just one of myriad challenges you can imagine, each of which can be correlated with your school’s math and science standards. But the coolest thing of all to imagine is how we can bring the real power of TBL into classrooms throughout the world!